The new PIP3x product is an EN50155 Class Tx certified rugged, highly flexible, and fanless embedded computer solution, using the 3rd. Generation Intel Core i7 and Celeron CPU. 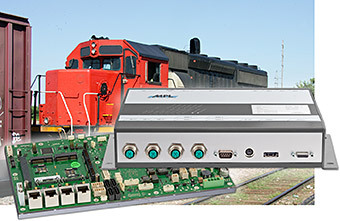 The PIP3x Family products have specifically been developed for the use in rugged applications such as Railway, Maritime, or Defense. For this solution, MPL uses the latest low power consumption and long-term available CPUs out of the Intel embedded road-map. The PIP3x Family is completely designed from scratch to insure highest reliability. The design is based on MPL's 28 years of experience in the field of low power engineering. The PIP form factor has been introduced more then 17 years ago and still remains in the same size and conception. The real advantage for the customers is the fact, that the products are designed for long-term availability. To ensure this, MPL designs and manufacturers the products 100% in Switzerland. All components are stocked at MPL Switzerland to guarantee that the products can be supported and repaired, even years after EOL for a product. • 4GB soldered on-board ECCRAM, expandable with additional memory modules. • Four Gigabit Ethernet ports with RJ45 or M12 connectors. • Internal expansions with PCI/104, PCI/104 Express, PMC & XMC, or PCIe cards (up to x16). • Internal miniPCIe slot for various extensions (WLAN, UMTS/GPRS and GPS, ...). • External expansion options with ePCI and eSATA equipment. • Four DB-9 connectors (RS232/422/485) allowing to connect any serial line devices. • USB ports supporting USB3.0 and USB2.0 equipment. • Operating temperature range -20°C to +60°C (optional -40°C to +85°C without fan). • Standard PIP housing in 3 different heights or mounted on cooling plate. • Long-term available - typically 10 years or more. MPL's Railway Solutions are EN50155 certified and undergo environmental testing to ensure reliable performance under a variety of conditions. The PIP3x product family has been tested from -40°C to +85°C, called Tx in the EN 50155 Standard. It also includes the Railways Standard EMC and mechanical tests. Each PIP solution delivered in extended temperature, will also be tested in MPL's own climate chamber.